Madelyn Garcia has worked 30 years for Toys "R" Us, rising to the position of store manager in Boynton Beach, Florida. When the chain filed for bankruptcy last year, she comforted herself with the belief that if her store were to close, she would get six months of severance. "We were counting on our severance pay. Severance was always given to employees when they closed a store," she said. "I think we should be compensated for all the years we put in." But when the company announced in March that it would shut all of its US locations, the 31,000 US employees were shocked to learn that they wouldn't get any severance at all. And so Garcia and dozens of other employee are protesting in an effort to shame the company into paying them and their colleagues. On Friday and Sunday they were outside of stores in the company's home state of New Jersey. On Monday they protested outside the New York apartment building of former CEO David Brandon, who ran the company when it filed for bankruptcy and began the liquidation process. They also protested Monday outside the New York City offices of the firms that owned the company -- Bain Capital, KKR and real estate firm Vornado. 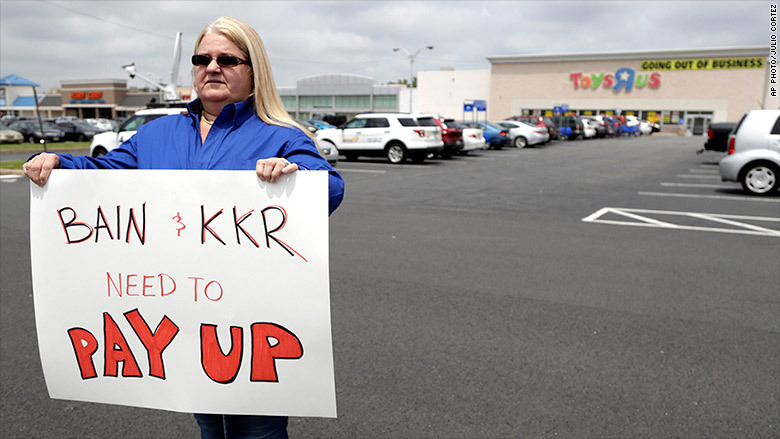 Cheryl Claude, an assistant manager at a New Jersey Toys R Us, holds a sign at a recent protest seeking severance payments for laid-off workers. "I'm angry," said Garcia about the lack of severance. "I don't blame Toys 'R' Us. It's a wonderful company. We love it. That's why we stayed on so long. I blame the private equity owners and the bankruptcy laws." In fact those bankruptcy laws prevent companies that are in the process of liquidating from ever issuing employees any severance. Those same laws however do allow companies that are liquidating to pay executives like Brandon millions in "retention" bonuses. The logic is that companies have to give the execs some reason to stick around to help turn a bankrupt company around. 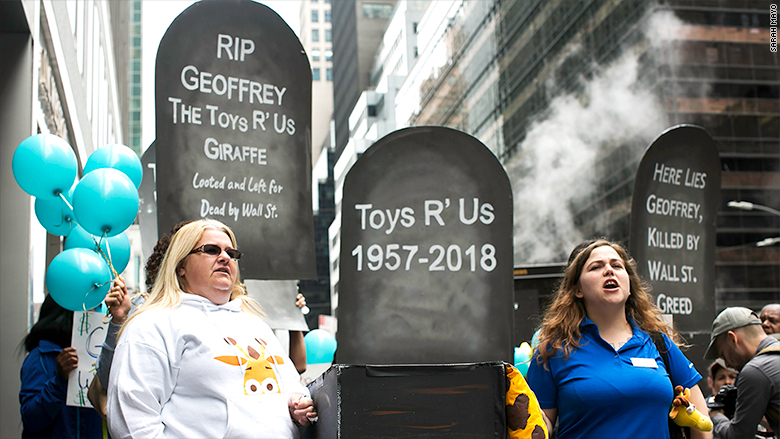 Toys 'R' Us employees protest in New York City on Monday. But once the entire company is slated to be shut down, which is the case with Toys 'R' Us, the law does not allow any severance to be paid until most creditors are paid. And that rarely happens. 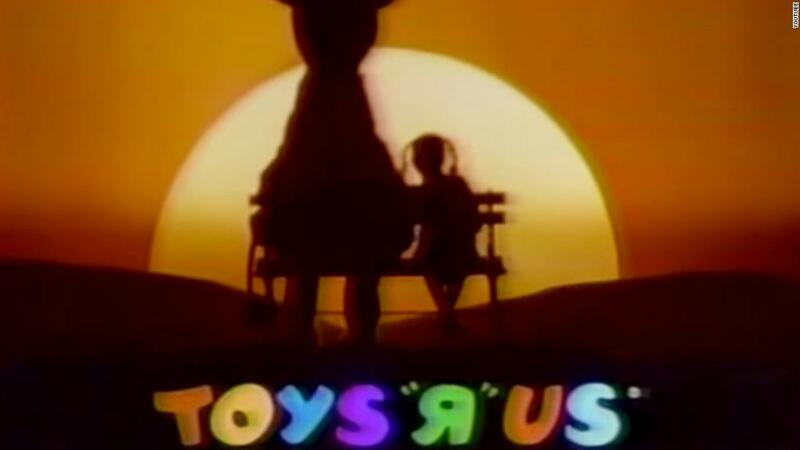 "Because we were forced to liquidate the US business, we were not able to follow the normal severance process," said Toys 'R' Us spokesperson Amy von Walter. The company did give 60 days notice to its employees, but that is required by federal law. Some of the employees who were laid off early in the shutdown process were paid for those two months even if they were no longer on the job. But employees who have to work through that 60 days notice, which concludes at the end of this month, aren't eligible for any pay if they leave for a new job. That's what happened to Garcia, whose store won't close until later this month. Garcia said the employees who are protesting know the odds are against them getting any severance. "We are hoping that it will change things, that we will get our severance pay," she said. "But if we don't, we want to make sure that changes are made so this doesn't happen [to others] in the future."